Alexander Babich was born in 1958. As the artist recalls, he spent his childhood in the steppes of Kazakhstan and remembers himself always with a pencil in his hand. Now Alexander Babich lives in a quiet village in the south of Russia, not far from the Caucasian mountains. “It is difficult to get inspiration among city walls, I need freedom and air.” In this sense, the Artist can be called a hermit. 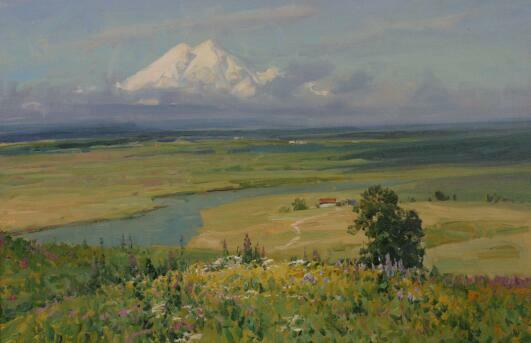 Unity with nature gives birth to new themes, revealing the many faceted artistic vision of Aleksander. Over the past 25 years, the artist goes for open-airs to the mountains of Dombai, Arkhyz, Teberdy, and Uzunkol for new impressions and creative discoveries. Mountains are the passion of the Artist. They are always full of surprise and variability, and these are their charms. “Here, within one day you can find yourself in all seasons of the year. The same landscape can change the emotional palette in one minute. That is why you can go to the mountains your whole life and each time you will discover something new”, says the Artist. Alexander creates his paintings in the technique of "Alla-Primа", in one approach, a maximum of two, when the finishing touches are applied. 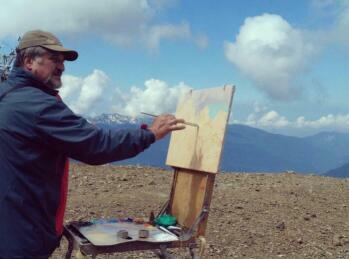 As the artist explains, that the landscape is a special specificity and requires quick execution. Looking at his paintings one can fall in love with mountains, even if you have never seen them in your life. If you do not fall in love, then at least you can understand the Russian saying: "Better than mountains can only be mountains." The power of this feeling is precisely in the mode of image transmission. And in his work there are no extremes, so inherent in modern art: photographic realism or fantasy - the generation of violent imagination. Everything, as in the good - old times: canvas, oil and work in the open-air. Aleksandr’s works are beyond fashion. You will want to look at them even 50 or 100 years from now. It is an eternal beauty of nature so skillfully reflected by the talented hand of the Artist. The themes of his works are various and without a second, and it is amazing that one artist can be so different. This artist is unique and recognizable. From thousands of other works it is easy to recognize Aleksander’s handwork. Using the minimum of methods, he achieves the maximum of expression.